McINTOSH, JOHN, farmer; b. 15 Aug. 1777 in New York, son of Alexander McIntosh and Juliet —; m. Hannah Doran (Dorin), and they had six sons and five daughters; d. between 19 Sept. 1845 and 10 Jan. 1846 near McIntosh’s Corners (Dundela), Upper Canada. 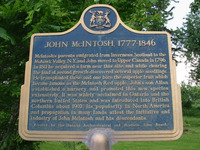 John McIntosh has been linked in Canadian legend with an apple, one of Ontario’s, if not Canada’s, agricultural successes in the 20th century. He is said to be the originator of the apple which bears his name. But the success story really belongs to the apple, with which McIntosh had not much more than a chance encounter. Neither the myth associated with him nor the reality comes even remotely close to the remarkable story of the American figure John Chapman, popularly known as Johnny Appleseed. John’s father was a Scottish immigrant who settled near Harpersfield, N.Y., in 1773 and was a loyalist during the American revolution. According to one account John came to Upper Canada in 1796, another places the date of his arrival at 1801, and yet a third claims he immigrated at age 18. Perhaps the first two versions come together in a chronology suggested by one writer, that he immigrated in 1796 and married in 1801. He apparently bought land in the St Lawrence valley, in Matilda Township, where on 8 March 1813 he purchased the west half of lot 9, concession 5. McIntosh farmed this property until his death. It was there that either he or his son Allan (as some accounts have it) discovered in the bush and transplanted the seedling apple trees now known as the McIntosh. There is no documentary evidence that conclusively establishes either the father or the son as the discoverer of the seedlings, which probably derived from the Fameuse (Snow) apple. A strong oral and recorded tradition credits Allan with the appreciation of the apple, its eventual propagation, and the establishment of a nursery later in the century. This assumption seems reasonable. As Harold Jones, a nurseryman in Maitland, Ont., put it in 1905, the best types of apple had “originated largely from chance seedlings. 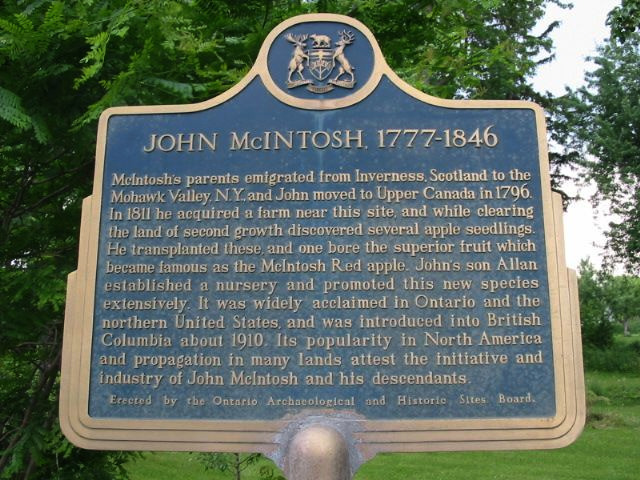 McIntosh Red was of this description but it was one of a million.” It is perhaps unfortunate that Macoun used the word originator to describe John McIntosh’s connection to the apple. He was sensible enough to credit propagation of the apple to Allan McIntosh. The apple’s fame would probably have come as an enormous surprise to John, an illiterate and pious Methodist farmer who had the good fortune to own the land on which the “one of a million” tree was found. He died at his home in Matilda Township, possibly in late September 1845. AO, RG 22, ser.194, reg.D (1842–60): 29–31. Dundas Land Registry Office (Morrisburg, Ont. ), Abstract index to deeds, Matilda Township, 1: 145, 184 (mfm. at AO). Reid, Loyalists in Ont., 93. J. S. Carter, The story of Dundas . . . (Iroquois, Ont., 1905; repr. Belleville, Ont., 1973), 243, 394, 433. J. G. Harkness, Stormont, Dundas and Glengarry: a history, 1784–1945 (Oshawa, Ont., 1946). M. E. [Hillman] Waterston, Pioneers in agriculture: Massey, McIntosh, Saunders (Toronto, 1957). Ont., Dept. of Agriculture, Fruit growing opportunities in Ontario, Canada ([Toronto, 1908]); The fruits of Ontario, 1906 (Toronto, 1907); Dept. of Commissioner of Agriculture and Public Works, Report of the commissioner of Agriculture on the products, manufactures, etc., of Ontario, exhibited at the International Exhibition, Philadelphia, 1876 (Toronto, 1877). Canadian Horticulturist (Grimsby, Ont. ), 22 (1899): 396–97, 506; 23 (1900): 24, 45–46. Fruit Growers’ Assoc. of Ont., Annual report (Toronto), 1873, 1876, 1881, 1883, 1885, 1889, 1891–92, 1894–95, 1900, 1903, 1905–6, 1909. L. A. Morse, “The biggest Mac of all: the MacIntosh – solid, reliable, luscious and our own,” Leisure Ways (Toronto), 4 (September 1985): 12–17. Ont., Dept. of Agriculture, Annual report of the fruit experiment stations of Ontario, under the joint control of the Ontario Agricultural College, Guelph, and the Fruit Growers’ Association of Ontario (Toronto), 1903; 1907: 12–13; Fruit Branch, Report (Toronto), 1910. Robert L. Fraser, “McINTOSH, JOHN,” in Dictionary of Canadian Biography, vol. 7, University of Toronto/Université Laval, 2003–, accessed April 21, 2019, http://www.biographi.ca/en/bio/mcintosh_john_7E.html.